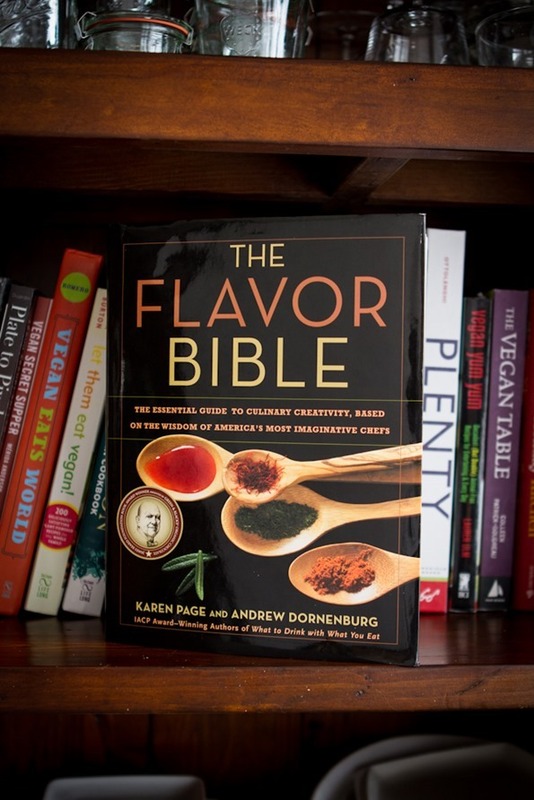 The Flavor Bible, described as “the essential guide to culinary creativity”, profiles ingredients and the corresponding herbs, spices, seasonings, etc. that pair well with each of these ingredients. As someone who has grown to love recipe creation, this book is a resource tool that I turn to when I’m looking for a nudge in the right direction. When I have an ingredient in mind that I’d like to cook with, I often look to this book for suggestions of other “compatible” ingredients that I can include in the dish. Each ingredient details things such as peak growing season(s), botanical relatives, taste (sweet, sour, salty, bitter), the function (cooling, warming, etc), weight (is it heavy, moderate, or light feeling? ), volume (is the flavor quiet, moderate, or loud? ), cooking techniques, tips, and incompatible flavors to avoid. All of these are described in greater detail at the beginning of the book. 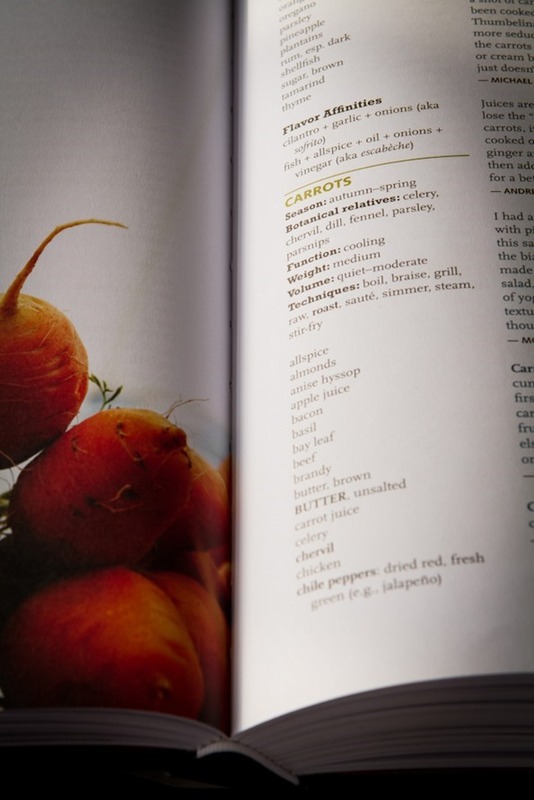 Below each main ingredient you’ll see a list (often 1/2-1 page in length) of all of the ingredients that the experts/chefs believe the food pairs well with. Bold caps indicate the most agreement among chefs. For example, carrots are said to pair exceptionally well with butter, ginger, lemon, maple syrup, orange, parsley, and sugar. Other ingredients that are said to pair well with carrots include cinnamon, coriander, dill, lime, spearmint, olive oil, parsnips, salt, tarragon, thyme, etc. I’ve found some of the flavor affinities in this book to be quite obvious (such as tomato + basil + mozzarella), but many seem new and exciting (cinnamon + lemon + tomatoes). These flavor affinities can provide the basis or starting point for recipe creation. Just looking at the carrots + cilantro + lime combo, I immediately think of a fun take on coleslaw or a salad. For the carrots + maple syrup + orange I start to dream about carrot cupcakes with orange frosting. I love that just a few ingredients can get the creativity flowing, especially during those times when my creative spark feels zapped. To be clear, this is certainly not a vegan or vegetarian book. Not even close. You will find a large amount of meat, fish, and dairy ingredients detailed throughout the book (with some photographs), but that isn’t surprising to me given it’s an all-purpose culinary reference. I skip over the ingredients that don’t apply to me, but I would obviously love to see a vegetarian or vegan version of The Flavor Bible or similar book in the future. 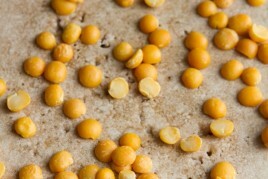 This would allow the authors to explore even more commonly used ingredients in veg cuisine. There have been a few ingredients that I looked up and couldn’t find in the book, so while it does provide a nice starting point for common ingredients it certainly doesn’t include everything I cook with. If you like to experiment with creating your own recipes, this book is worth checking out. My advice is to check it out at your local bookstore or library in person to see if it will be a good fit in your own kitchen! 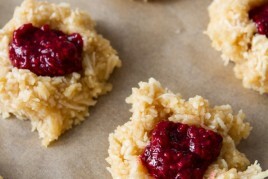 Do you enjoy cooking and recipe development? Have you found this book, or any others, to be useful tools along the way? Congrats to you both! I will email you shortly to collect your information. What a lovely giveaway! Enjoy ladies!! I’ve never heard of the Flavour Bible- but I can definitely see it’s uses. I might just have to pick a copy up for myself. Thanks for the review on it! Hi Seraphina, Yes eggs and dairy are indeed plenty in his book! However, if you are comfortable with vegan cuisine I think it would be safe to say that many of the recipes could be adapted to be vegan. Obviously, the flavours and overall recipe might change, but there’s enough inspiration to work with if you like that challenge. There is also a very liberal use of oil (much more than I use in my own recipes) so that will be another challenge when I cook from it. I haven’t had a chance to cook from it yet (darn cookbook manuscript! ), but I look forward to trying to veganize some of the recipes in the future. If I do, you’ll hopefully see some appear on the blog. I’d give it a look through in the bookstore before buying it. Oh Angela is this absolutely WILD that you love The Flavour Bible too! I got it as a birthday gift almost three years ago and consult it all the time. It was a great way to start creating my own recipes. It’s also great when you have a bunch of ingredients at home but aren’t sure what to do with them. Thanks for sharing! I’ve had this book on my Amazon wishlist for ages. Really tempted to buy it now you’ve given it such a good review! This book is seriously something I NEED. I constantly look the internet for pairings, but this is SO much more convenient!!!! Love it! I’ve had so many people recommend this book to me….I think it’s about time I buy it! this book looks fantastic! i love finding ways to be creative with cooking and not always feel like i have to follow a recipe. great post! I also love this book, it has definately been my most used reference book. Love the Flavor Bible! I just wish that I remembered I own it more when I’m trying to think up recipes! DER!!! I am IN LOVE with this book. I have had it for a few years now and was literally just telling a friend about it last night. A kitchen MUST for anyone who cooks. I will check this out now that you have give it such a wonderful review! I am adventurous when I am in the mood to cook and this certainly is going to be a lot of help. This book sounds amazing!! I am constantly looking for new flavor combos and ideas for meals, and this could be a real asset in the kitchen! Thank you for the review! I’m going to have to pick up a copy!! Love cooking and creating recipes :) Will be attending Vida Vegan Con in May. Hope to see you there! This book looks awesome, I’ll have to get it. When I need combination I usually use Google but I think this book will provide more unique combos. Thanks for sharing. 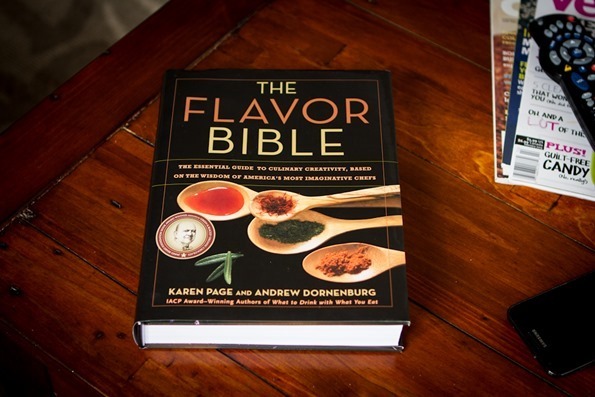 I actually haven’t heard of the Flavor Bible, but I am definitely going to get my hands on a copy! What an incredible resource, I’d love to play a lot more with ingredients and find new combinations and ‘affinities’. Cinnamon, lemon and tomato? Very intriguing, thank you for posting such an informative review Angela! Thank you for sharing this! I had no idea such a book existed! I’ll put this one on my wish list! This book looks fantastic! What a great resource to have in the kitchen. I love the Flavor Bible! I need to get my own copy. Right now, I work from “Culinary Artistry,” which was the precursor to the Flavor Bible. Similar, but not quite as good. I’ve also found Michael Ruhlman’s “Ratio” book to be quite helpful for recipe development. Grats ladies! I’m going to have to get a bigger bookshelf with all of these amazing cookbooks you’ve been recommending. That book sounds very intriguing. And you MUST make the carrot cake cupcakes with orange frosting. My saliva glands are going nuts just thinking about that flavor combo! I am so excited to have won the book. The funniest part was that I was at the bookstore today looking at Undiet and as much as I wanted to just buy it, I thought that I should at least wait until I saw who won the contest. I never win anything, so this is a sign that now is the time to clean up the way I (and my family) eat!! Thanks so much. This book catch my attention right away, I just order it actually, I think it would make a wonderful gift for my daughter, her birthday is coming at the end of this month. Great review, thanks for sharing! I think that I should get this book for my fiance, he’d absolutely adore this approach to flavor. Even if its not vegan, it seems like something that could inspire a lot of cooking ideas — and just might be something great to have in the house for those curious afternoons! you are right – a vegetarian / vegan version would be great! Oh my gosh Ange, thank you so much for reminding me about this book! I’ve been wanting to get my hands on it for ages and happen to have an Amazon gift card coming my way so this will definitely be what I spend it on! Like you said, some of the flavour pairings/affinities sound obvious, but I always love trying new ones. I think I could read books like this like non-foodies read novels! Wow, this book looks really neat. Thanks for sharing. I can just imagine myself going crazy in the kitchen, putting crazy ingrediens together. I can’t wait to get started. Have you read their other book, “Culinary Artistry”? If so, which one do you prefer? Thanks for a great review! I would love to buy this, cooking is my passion and I am eager to increase my skills and knowledge as a home cook. I would like to try new things and it’s good to know that this book contains a lot of recipes and alternatives which you can use if you don’t have the main ingredient. This is also perfect if you would like to have an experiment, very helpful. I can’t wait to have this on my hands. Thank you! This sounds like such a good resource! I love discovering unexpected flavour combinations that I never would have thought of. I have been eyeing up this book for so long. I really should check it out. I’ve never heard of this book, but because I’m into food and wine pairings, it intrigues me so! I’ve actually never heard of this book so thanks for sharing! To be honest, I love learning about books like this but I can be bad when I get them – I’ve had From Plate to Pixel for over a year now and read maybe one chapter. I just need to have a staycation with my camera and sit down and go through it like a course! This books sounds like something I would love to have in my kitchen. I am glad I stopped by your blog this morning. What a neat book. I had no idea anything like this existed! Lucky winners! I would love a free copy but I must say it looks worth the purchase also, thank you for the review. This is exactly the kind of reference I wish I had when I started cooking for myself last year and was basically learning how to cook. I will definitely check it out. Thanks so much for sharing! Let’s write the vegan version together! :-) It’s so much fun to turn the kitchen into a lab. I love developing, testing, and editing recipes. It’s always so wild how sometimes the easiest, most basic list of ingredients winds up being the most challenging recipe to test. All about trial and error! this is the first time I hear about this book and I already like it. Congratulations for the winner! Can I buy it in Amazon? Yes you certainly can find it on Amazon. enjoy! Wow, this book sounds amazing. I think it will be a wonderful gift to us :) My wife loves cooking and I have to say, I love her cooking. It is always so flavorsome. Thank you for your review and congrats to the winners! But on another kinda sorta related note: what would be a replacement for sweetened condensed milk? I have this recipe i really REALLY want to make…but it calls for the milk…any suggestions? Although I am not familiar with the Flavor Bible, I would love to check out the recipes. It is because I love to browse recipe books. 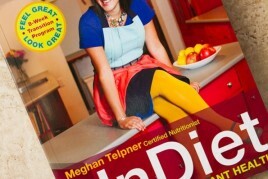 I guess this book is suitable for me since it has a lot of recipe that includes meat, dairy products, etc. Perhaps it will be helpful if there will be a Flavor Bible for the vegans in the future. Never heard of it, but it sounds like my next purchase! My favorite cookbook of all time, from which I’ve been cooking for MANY years and have veganized many recipes is Ethnic Cuisine by Elisabeth Rozin. Similar idea – she calls them “flavor principles” – but this sounds more expansive. Awesome! Thank you!! Also, just recently discovered your blog and made the pumpkin baked beans this week for my client. OUT. OF. THIS. WORLD. Thanks for the review! Speaking of Carrots (as that was the page pictured)…my newest flavor obsession is fresh carrot sticks and natural peanut butter!! its subtle but sooo yummy! Not to sound cliche but I love the look of this book too! The fact that so many have sung its praises makes me want it even more. Off to Amazon I go haha. Thanks for revealing it to me! This sounds similar to the Flavour Thesaurus, which is one of my most beloved foodie texts. I love it because each entry has a recipe or anecdote to flesh out the pairing, which makes for great inspirational reading. I love this book! I got it a few years ago as a wedding present, and decided to get one for myself as well. I use it all the time! Wondering if you are able to respond to your email fairly quickly? I’m curious if you are interested or know of anyone in your area or close looking for a roommate or a rental person? I’m very responsible, in my 30’s, and quiet and private. I’d LOVE to meet up sometime for lunch :) I live in South Ajax and am looking for elsewhere. Hi, Angela. Thanks for the review on this book; I love reading about what others have read and recommend. I’m definitely going to buy this book as I think I will find it useful. Awesome! I will definitely be adding this to my amazon wishlist. I know this is an old post but I remembered you mentioned this Flavor Bible and went in search of the post. 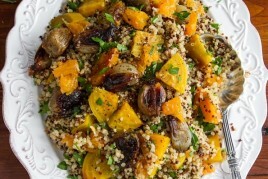 I don’t know if you are aware that the same authors have just released a new book – The Vegetarian Flavor Bible: The Essential Guide to Culinary Creativity with Vegetables, Fruits, Grains, Legumes, Nuts, Seeds, and More, Based on the Wisdom of Leading American Chefs Hardcover – released Oct 14 2014. Not vegan but worth a look…. I downloaded a sample from itunes. Maybe you could review it and have another giveaway??? Me again, I meant to leave the amazon link..check out “what other items do customers buy after viewing this item?” I wonder what it could be???? Hmmmmm……..